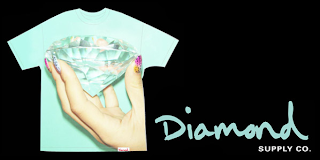 2007 saw the release of one of my favourite shirts to date - the Diamond Supply 'Cold as Ice' tee. I don't think it gets much better then the black tee with the full front diamond and hand. My girlfriend may disagree with this statement but for me this shirt was worth every penny. Diamond has followed it up with the 'Colder Than Ice' set to drop in the up coming weeks. The tee features a step back look from the 'Cold as Ice' tee and features model Nilanti. I can't wait to see what colors are offered. I don't think this tee is as hype as the 'Cold as Ice' but none the less this is sure to be a show stopper.